Sharon is passionate about sharing her knowledge and sense of wonder with others, especially children. Known to many children as "Sharon heron", she has been teaching environmental education for more than 10 years. A native of Upstate New York, she has a BA in Environmental Studies from University at Buffalo and a MS in Education from Dominican University. Sharon is the 2011 Terwilliger Environmental Award winner for excellence in environmental education. 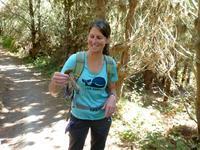 She teaches science at Marin Country Day School and Hiking Marin Trails for College of Marin. She also designs and leads programs for Point Reyes Field Institute, Marin Nature Adventures and volunteers for Point Reyes National Seashore Association. Kevin is a veteran Marin County naturalist and co-founder of Marin Nature Adventures. He is intimately familiar with Marin's topography and fauna. His knowledge and guidance inspires a feeling of connectedness with the land and with our cultural history. Kevin has trekked hundreds of trail miles through Marin in all seasons and weather. Kevin loves our trails and knows how to enjoy them and share them with respect. Beyond Marin, he has mountain biked across the United States, Costa Rica and Baja Peninsula. He is the first ever recipient of the College of Marin's Certificate of Natural History. He earned an MS Marine Biology degree at San Francisco State's Romberg Tiburon Center and a BS Economics degree from the Wharton School at the University of Pennsylvania. Kevin is a Wilderness First Responder.